Address: 6000 Cypress Gardens Boulevard. 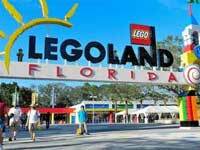 LEGOLAND Florida is specifically aimed at children aged 2 to 12. With over 50 family rides, "hands-on" attractions and shows, LEGOLAND Florida provides education, adventure and fun in this second park of its kind in the United States. LEGOLAND Florida is open 5 days per week, closing Tuesdays and Wednesdays, but is open daily during specific holiday periods. Take your own food, LEGOLAND can be expensive. 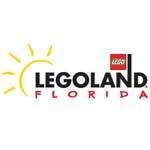 Island in the Sky is a 150 foot rotating platform that gives you full a 360° view of LEGOLAND Florida. A double decker carousel that is the centerpiece of Fun Town. Children can choose their favorite horse. The bumpy ride and beeping horn are sure to induce laughter from riders of all ages. Get into your semi truck and drive through the desert to deliver your cargo. Dont forget to Buckle Up. Kids ride a LEGO themed horse through a number of medieval scenes where they will encounter other riders in a joust. An indoor - outdoor steel roller coaster that features a hilarious, behind the scenes view of life within the enchanted LEGOLAND Castle. Climb aboard this mysterious wooden train ride powered by the Merlin's magic. A wooden coaster that curves and dips in and around a prehistoric jungle of animated and life sized LEGO brick dinosaurs. Explore the wilds of Africa with gorgeous, life like LEGO animals. Get launched 15 feet up toward intricate, brightly jewelled LEGO scarab beetles perched on top of two monumental obelisks. This dark ride invites you to fire laser blasters at targets and brave the rugged Egyptian landscape in all terrain roadsters, while attempting to unearth the vast treasures of a forgotten empire. A pint size version driving school course for children ages 3 through 5. A "real life" driving experience for children ages 6 through 13, where kids receive their official LEGOLAND driver’s license. Experience the thrill of flight on this suspended steel coaster. All aboard for this fun filled ride that allows you to captain your own mini vessels. Kids and parents alike hoist themselves up to the top of a tower to get a great view of the entire park and lovely Lake Eloise, and then enjoy a fun "free fall" to the bottom. Dodge water blasters on this dual water carousel ride as you zip in and out of waves. Brave guests feel the power of acceleration, braking and maneuverability as they race a life size LEGO© TECHNIC TM vehicle along a wild roller coaster track. A zany pedal powered spinning machine that shoot riders into the air. A first hand look at how LEGO bricks are made from factory to finish. Part of the expanded Florida area, with an interactive Daytona International Speedway® racing experience where guests can race LEGO brick cars. Florida encompasses the entire state from Mallory Square in Key West to Bok Tower in Central Florida and antebellum mansions in the Panhandle. This section gives guests a close up look at the Kennedy Space Center, complete with Shuttle launch, astronaut training and Rocket Garden. This pirate themed section hosts a full on swashbuckling pirate adventure as two opposing pirate ships and their "mates" battle it out upon the high seas. California features landmarks from Southern California to San Francisco, with Pier 39, the Golden Gate Bridge, Greumann's Chinese Theater and more. Washington, D.C. sports faithful recreations of the White House (including the first family and "first dog"), the U.S. Capitol building, Smithsonian, Washington and Jefferson monuments and parts of Georgetown. An animated marching band parades in front of the Capitol and tiny cherry trees blossom every spring. Las Vegas features the world famous Strip including the Luxor Las Vegas, New York, New York Hotel and Casino, Excalibur, Mirage, Treasure Island, Tropicana, MGM Grand, Venetian, Stratosphere tower and two iconic structures of Paris Las Vegas: the balloon sign and Eiffel Tower. "The Strip" at LEGOLAND also features a miniature wedding chapel, monorails and real life sounds recorded in Las Vegas. A special play area for children to slide, climb and crawl around a whole host of friendly farm animals. Tots become voluntary firemen and work together to extinguish "flames". A multi level tree and rope climb adventure for children to enjoy. Where families compete with each other in fire and police vehicles to be the first to put out a simulated "blaze" and save the day. Kids and parents alike hoist themselves up to the top of a tower to get a great view of the entire park and lovely Lake Eloise, and then enjoy a fun "free-fall" to the bottom.